Imagining your room's intended paint color with an online paint visualizer is fun, but often something is lost in translation. Paint colors on a screen will always look different from paint colors on a wall. Not to mention, the rooms depicted with the online visualizers look absolutely nothing like those in your own home, and uploading your room photos never seems to turn out well. So, nothing can compare to the color fidelity of applying paint to your actual wall. This is the promise of paint samples. And it is a promise that delivers since sample paint on a wall lets you see the color in all stages throughout the day. 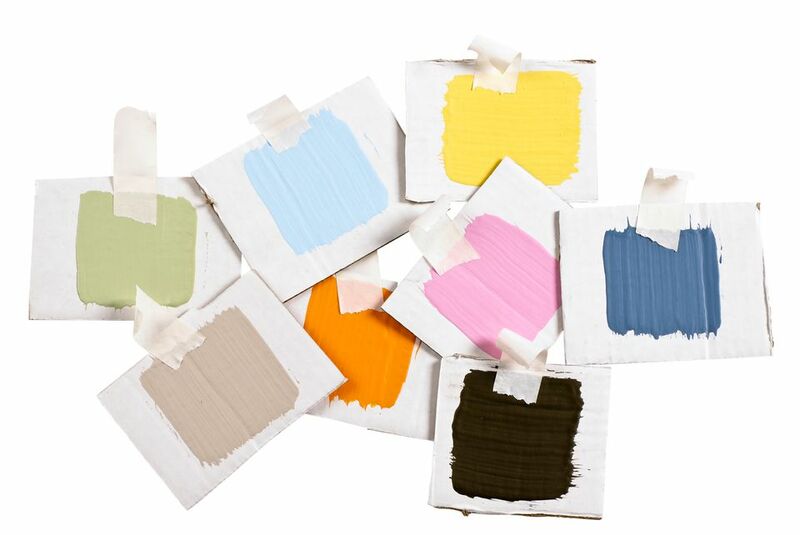 Paint samples come in either liquid form as testers or in solid form as swatches. Paint samples or testers are bottles of liquid paint ranging from 2 ounces to 8 ounces that are applied directly to your wall or to a piece of white foam board or scrap drywall. Do not apply to cardboard, as this is too absorbent. Solid paint swatches are thick paper squares or rectangles representing paint colors. These come either loose or bound as palettes in graduated form. Liquid paint samples allow you to use disposable foam brushes or rollers, or even real brushes, to apply sample paint to your walls. Create a coverage box with painter's tape and stay within that box as you apply the sample. With 8-ounce paint samples, you have 1/16th of the volume of a gallon of paint. Since a gallon of paint typically covers 400 square feet, with an 8-ounce sample you can cover as much as 25 square feet. Consult the instructions on the tester, as some paint samples only cover about 16 square feet. For a one-wall application such as an accent wall, you will be able to create a 5-foot by 5-foot square of test paint. For entire rooms, it is beneficial to coat all four walls because of shifting natural light during the day and artificial light at night. This amounts to about 6 1/4 square feet of test paint per wall (each square would be 2 1/2 feet by 2 1/2 feet). Paint samples often are usually not the actual paint that you would purchase in larger quantities. Paint manufacturers thin out the paint in samples, imbuing it with fewer solids that produce true paint build. Pigments are accurate, though. You can find Behr and Glidden paint samples from Home Depot in-store or online in 8-ounce sizes. Free Behr and Glidden liquid paint samples are not available, but color swatches as loose cards are free. For heavy users of paint, such as professional painters and designers, color fans displaying 1,434 colors are available for purchase. Benjamin Moore offers giant swatches that they call Paint Color Sheets in 8-inch by 9 1/4-inch sizes. Benjamin Moore also offers pint sizes of liquid paint color samples for purchase from their collection of over 3,000 colors. Boutique paint company Country Chic Paint frequently runs free paint sample programs. Keep an eye on their site or on Facebook to catch these promotions when they occur. Dunn Edwards will provide up to 100 free color cards from their selection of 1,996 Perfect Palette colors. Dutch Boy's paint sample program offers you four times more paint than the 8-ounce samples with its Twist & Try quart samples. Platinum Plus and Forever paint both come in 8-ounce sizes. All are available for purchase. Ecos Paints sells tidy little jars of paint samples (2 ounces) in three-packs. Samples are free (rebated) if you purchase one or more gallons of paint. Paint chips are available free. Kelly Moore Paints will give you one free quart of sample paint if you order from them online. The order will not be fulfilled via the online request, though. You receive a coupon that you take to a Kelly Moore Paints store in participating areas. PPG Paints provides jumbo-sized 8-inch by 8-inch color cards for free by request online. Sherwin-Williams paint is sold at standalone Sherwin-Williams stores. Color To Go is the largest sized paint sample available, producing around 75 square feet of coverage. Loose paint chips are available for free at Sherwin-Williams stores. Sherwin-Williams does not offer paint fans. Valspar paint is found at Lowe's Home Improvement stores and 8-ounce samples are available for purchase either in-store or online. Loose paint chips are available for free at Lowe's. Valspar does not offer paint fans.